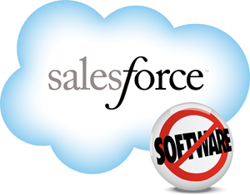 Salesforce.com, the enterprise cloud computing company, today announced results for its fiscal second quarter ended July 31, 2012. The company reported the total Q2 revenue was $732 million, an increase of 34% on a year-over-year basis. Subscription and support revenues were $687 million, an increase of 35% on a year-over-year basis. Professional services and other revenues were $44 million, an increase of 20% on a year-over-year basis. Q2 GAAP net loss per share was ($0.07), and non-GAAP diluted earnings per share was $0.42. GAAP EPS calculations are based on a basic share count of approximately 139 million shares. Cash generated from operations for the fiscal second quarter was $136 million, an increase of 64% on a year-over-year basis. Total cash, cash equivalents and marketable securities finished the quarter at $1.8 billion.